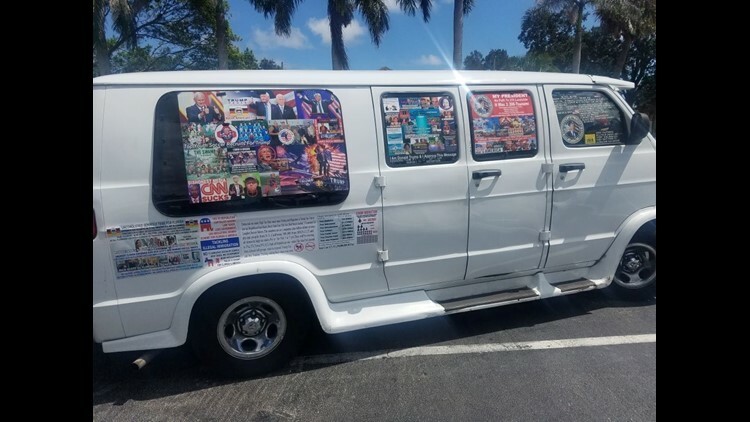 Cesar Sayoc's van, covered in political stickers supporting Donald Trump and opposing the president's critics. NEW YORK – Pipe bomb suspect Cesar Sayoc has been indicted on charges of using weapons of mass destruction for allegedly mailing 16 improvised explosive devices to prominent Democrats and critics of President Donald Trump. In a 30-count criminal indictment filed Friday in federal court, prosecutors accused Sayoc of threatening to injure his intended targets, violating federal law by sending the devices through the U.S. Postal Service and other charges. If found guilty on the most serious charges, he could be sentenced to life in prison. "Sayoc's alleged conduct put numerous lives at risk," Manhattan U.S. Attorney Geoffrey Berman said in a statement. "It was also an assault on a nation that values the rule of law, a free press, and tolerance of differences without rancor or resort to violence." The packages Sayoc is accused of mailing to former secretary of state Hillary Clinton, former CIA director John Brennan, actor-director Robert De Niro, former national intelligence director James Clapper contained photos of the recipients that were marked "with a red 'X,'" prosecutors said. A similar package sent to the billionaire investor and philanthropist George Soros contained a red X over a printout of his name, prosecutors said. The indictment did not include federal prosecutors' previous allegations that Sayoc mailed similar bomb-laden packages to former Presidents Barack Obama and Bill Clinton and former Vice President Joe Biden. It was not clear whether the indictment would eventually be superseded by a new filing with additional charges. The Manhattan U.S. Attorney's Office declined to comment. The federal law definition of a weapon of mass destruction includes destructive devices such as bombs, grenades or rockets that are "designed or intended to cause death or serious bodily injury." Before the indictment, Sayoc had been accused in a criminal complaint that included five federal charges, including illegal mailing of explosives and making threats against former U.S. presidents and others. 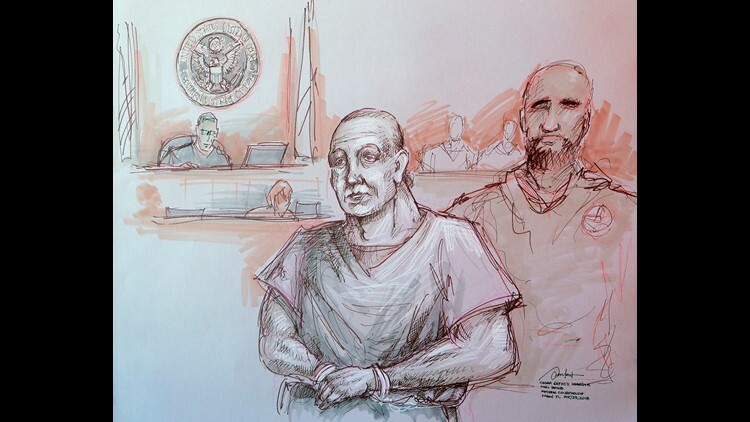 In this courtroom sketch, Cesar Sayoc, left, appears in federal court, Oct. 29, 2018, in Miami. Sayoc is accused of sending pipe bombs to prominent Democrats around the country. No one was injured. Federal investigators, alerted by postal workers and others, recovered the packages before the devices could explode. Preliminary FBI analysis found forensic evidence that links Sayoc to 11 of the 16 packages, the Manhattan U.S. Attorney's Office said Friday. The indictment calls for Sayoc to forfeit all assets used to conduct or conceal the alleged crimes — and called for similar forfeiture by "any entity or organization engaged in planning or perpetrating" the alleged mail bomb spree. Federal investigators arrested Sayoc on Oct. 26 in Plantation, Florida, just west of Fort Lauderdale. They said they had linked him to fingerprint and DNA evidence the FBI Crime Lab recovered from some of the packages. He has been held without bail since his capture. Sayoc had been scheduled to appear in court on Tuesday for a hearing on the earlier charges. The indictment means that hearing is no longer necessary. A new hearing to arraign Sayoc on the indictment charges has not yet been set. Sayoc's swift identification and capture by federal investigators capped a week of heightened national alarm about potential terrorism as the mysterious explosive-carrying packages were found across the country. Sayoc was estranged from relatives and was living in his van while holding a series of jobs as a food delivery person and disk jockey, investigators said. His white van was covered with pro-Trump and anti-Democrat stickers – including one showing cross-hairs across an image of Hillary Clinton. The investigators said a laptop found in the van contained lists of addresses that matched those found on the bomb-carrying packages mailed from South Florida. They also found copies of return labels with the same address and misspelling of Florida Democratic Rep. Debbie Wasserman Schultz’s name as the return labels on the bomb packages, they said. The return labels had the same typeface, font and font size as the packages, prosecutors said in a previous court filing. While searching the laptop and Sayoc’s cellphone, investigators said, they found Internet searches to find addresses for his intended targets and their families. Other electronic files found in the laptop contained addresses for additional potential Sayoc targets, prosecutors previously revealed. Those people have not been identified publicly, but federal investigators said all were notified by the FBI.